I’m back with a quick post to ask you to check out my friend’s YB Green Upcycled Glass Jewelry Collection and #ShopWithACause!! Yasmin Bowers started YB Green as a solution for the glass not being recycled in New Orleans after Katrina … especially focusing on glass in Lower 9th Ward. 10 years later and still New Orleans doesn’t always include glass for recycling. Yasmin created this Fabulous Wearable Art Solution many years ago. I’ve watched her Fabulous Growth & Expansion for this Mission with a Purpose. I’m truly proud of what’s she’s accomplished … especially starting this without knowing a thing about creating glass jewelry. And, she does it all herself … picks and gathers the glass, crushes, melts, molds and designs. She’s the Real Deal so let’s support her Cyber Monday Deal today at 50% Off!! Please check out her site and stock up on Truly Fabulous & BEautiful 50% OFF Deals she’s doing today only!! 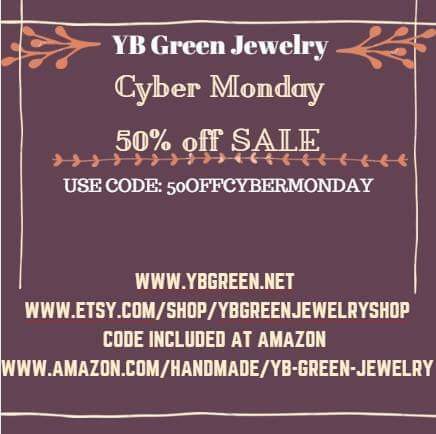 Go to https://www.etsy.com/shop/YBGreenJewelryShop and http://www.ybgreen.net and use code 50OFFCYBERMONDAY to support this Small Biz Owner and #ecofashion #sale #CyberMonday. Only a little while left to get in on this Cyber Monday Sale!! It’s great to shop in bulk too!! A couple just did this on Friday at the Bizaart Event that Yasmin was at. They had both gone down to New Orleans after Katrina and help with Rebuilding. They LOVE New Orleans so much and the wife saw that the glass was from Lower 9th Ward and loved the designs. She decided to get 8 pieces of jewelry for gifts for her office. Her husband thought that was such a great idea plus he was so in Love with New Orleans as well that he bought 6 gifts for his office too. Yay for such Eco-Fabulousness!! Also, here are some pics from a photo/video shoot in October she asked me to do for her Fall Collection. I’ve included some of her other pics of jewelry (more styles and designs on her sites listed above). I’ve even included some pics of Yasmin in action! Thanks Gratefully & Happy YB Green Cyber Sale! !